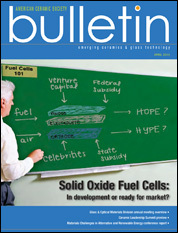 An article about the past, present and future of solid oxide fuel cell technology co-authored by University of Maryland Energy Research Center director Professor Eric D. Wachsman (joint, Materials Science and Engineering, Chemical and Biomolecular Engineering) recently graced the cover of ACS Bulletin, the journal of the American Ceramic Society. The feature, titled "Solid oxide fuel cell commercialization, research and challenges," was written with National Academy of Engineering member Subhash C. Singhal, Battelle Fellow and director of fuel cell research at the Department of Energy's Pacific Northwest National Laboratory. Solid oxide fuel cells (SOFCs) are promising devices for generating energy in an environmentally friendly way by a direct conversion of fossil and renewable fuels into electricity and high-quality heat. While the technology has been explored for decades (at least 70 years, according to Bulletin editor Peter Wray) technical challenges have slowed their development and large-scale deployment. But these are gradually being overcome, and more products are entering the market. Interest in SOFC solutions has risen sharply: Singhal and Wachsman point out that since 1989, the proceedings of the International Symposium on Solid Oxide Fuel Cells has grown from 60 pages to over 1000. Singhal and Wachsman outline the U.S. Department of Energy's fuel cell program's three focus areas (cost reduction, coal-based systems, and research and development); fuel cell stacks currently being used in heat and power systems around the world; an overview of recent findings on materials tested for use in SOFC components; and the demand for SOFCs for use in vehicles, particularly trucks that could use an auxiliary power system for refrigeration and other functions without having to run their diesel engines. The authors also discuss two of the biggest obstacles to widespread implementation of fuel cell technology: operating temperature and maintaining high power densities. A "tremendous effort" was required to lower typical SOFC operating temperatures from 1000°C to 800°C, but this still requires them to be constructed of specialized (and therefore more costly) materials. At present, if the operating temperature is lowered too much—a temperature closer to 100°C is the current goal—the SOFC's power output sharply drops. Advances in anode and cathode technology and the development of higher-conductivity electrolytes may help overcome this problem. See E.D. Wachsman and S.C. Singhal, "Solid oxide fuel cell commercialization, research and challenges," American Ceramic Society Bulletin, 89 (3) 2010.